There has been a significant rise over the last few years of squirrels nesting and harboring in loft and roof spaces in fact the female squirrel having her young in the loft produces another generation of squirrels that will more than likely have their own future young in a loft. In fact trials we carried out proved without doubt that some of the female young that were tagged ended up the following year either nesting in the same loft or very close by. 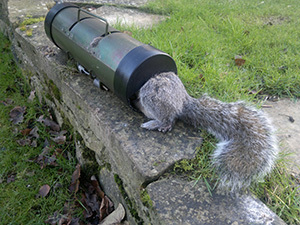 Trapping squirrels in loft spaces can be very straightforward or can turn into a long drawn out frustrating nightmare. Before you embark on a squirrel eradication campaign you need to make sure that you have squirrels in the loft and not other rodents or birds. Once you are sure that it is squirrels in the loft you will need to decide if you are going to use live or lethal traps. Homeowners are not permitted to use or buy grey squirrel poison and if this is the route you want to go down you will need to employ the services of a qualified pest control technician, it is illegal to use any other poison on squirrels other than the approved bait. 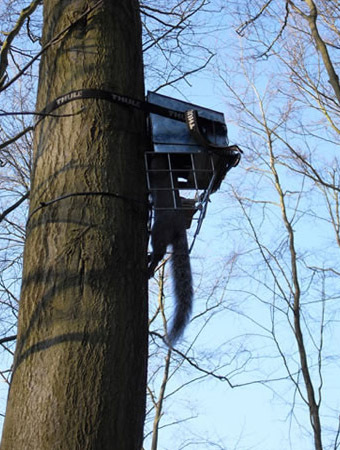 If you are going to use live catch traps you will need to be able to dispatch your squirrel humanely either by shooting or a blow to the head - these methods are covered on the HUMANE DISPATCH page. If you are not comfortable with killing your captured squirrel I suggest you use a lethal trap that will do the job for you. There are an array of spring killing traps available today but not all are suitable for amateur use and a I would suggest sticking to the Fenn Box, Kania 2000, WCS Tube Trap and Fenn cages. The bodygrip traps are a little harder to set and use without experience. The choice of live catch trap is more limited but they all work on a similar principle with the only exception being the Elgeeco. 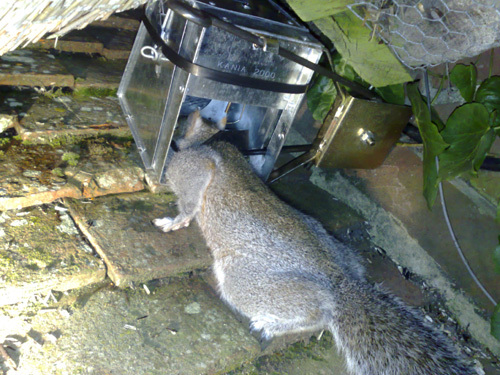 When squirrels enter a property with the intension of either nesting or harboring they will generally enter under the tiles between the top of the sofit box and will often chew a hole or widen and existing low point to gain access. In some cases squirrels will go into the side of dorma windows which can make trapping inside difficult because of the access into the dorma space. Squirrels will also use disused chimney stacks and I have in the past taken out nests of squirrels from behind gas fires in living rooms. When the squirrel enters the roof space it will build its nest close to entrance it is using and will often tear up insulation or bring in nest material from outside, its droppings can be seen in the photos but they are similar to the brown rat but slightly rounder and 1½ to 2cms in length, they will generally toilet in one place. What ever traps you decide to use place them as close to the nest site as possible although it is not always easy to get low down under the roof struts and if this the case just place them as close as you can. Bait you traps with peanut butter, hazelnut oil etc as you are encouraging the squirrels into the traps by smell as it is normally dark in the roof space. Some people have left the loft light on to see if it improves catch rate but I have never tried this method myself. Remember you need to check your traps at least once every 24hr hours but when trapping squirrels inside it is best to check twice especially if you have out at work. If the traps fire when you are home you will very often here them go off. If after a week or so you have had no catches but the noise or squirrel activity continues it may be worth a change of tactics and that can mean trapping outside in the garden, on top of a flat roof or even up at gutter height close to the entrance point. Remember it is illegal to release a captured grey squirrel back into the wild. 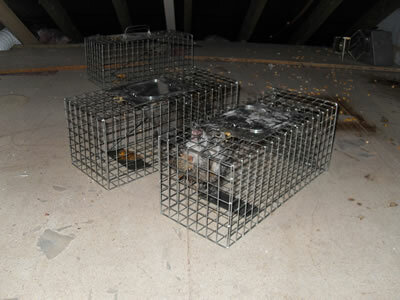 The three traps we would recommend for roof spaces are the Kania 2000, WCS Tube Trap and Live Catch Traps.